At the 2016 NCMPR conference, Andrea Hanstein of Foothill College and Heather McDorman of St. Charles Community College gave a presentation titled “Managing and Inspiring a Successful Team”. Andrea shares many of the management practices that she and Heather employ at their schools. This includes tactics that can help anyone turn around a dysfunctional team. She also tells us about how her marketing team manages their department as a real-world advertising agency with their work displayed on the walls and the way they treat their college associates as clients. Absence of Trust: If Teammates can’t trust each other, it’s hard to have an open dialogue. Create team-building exercises, and lead by example. Create connections with your team so you can be the bridge that brings them all together. Fear of Conflict: People are passive and will avoid situations that may be awkward. It’s important to work through that awkwardness and make your team as comfortable with each other as possible. Lack of Commitment: Not every employee will enjoy the work they’re doing. It’s important to open up a dialogue with them to discuss why they feel the way they do. It may be time to let them go. Lack of Accountability: Some team members refuse to take responsibility for their actions. A lot of times employers shuffle around problem employees to avoid the problem. It’s important to recognize the problem and solve it, rather than move the problem. Have a discussion with the employee and, if it doesn’t help, it may be time to let them go. Inattention to Results: A few team members may have an ego problem. They will put their own success above the success of the team. While it is important to have ambitious team members, they must also support their colleagues. Coercive: A more dictatorial type of leader. Very strong leader that’s useful for emergencies. A day-to-day use of this style may be too much, so be sure to incorporate this style sparingly. Authoritative: Focus on a goal or vision. Bring everyone together, and create a guideline for team members to follow. Affiliative: A creative leader who focuses on people. The best style for team building and creating alliances in and out of the office. Democratic: The listener. Allows the team to pitch in and feel heard. The employees matter too, so it’s best not to ignore them. Pacesetter: Lead by example. Employees are expected to work with the same level of determination as the employer. This style is incorporated when the team is strong enough to operate like clockwork. The Coach: The nurturer. Focus on an employee’s strengths and improve weaknesses. Make the employee the best employee they can be. Have a staff retreat: It’s important to get to know your colleagues. A more relaxed setting may break them out of their shells. Talk about the bad: Employees can sometimes hold their true feelings close to their chest. It’s important to discuss any problems they have. Once it’s discussed, the team should come together to try and solve the problem. Icebreakers: Design an icebreaker focused on employee goals. Have them discuss what they want to do with their careers and what they’re passionate about. Learn more about them, and more importantly, their needs. Build Communication: Have a weekly meeting with the team. Encourage everyone to share their work schedules with each other. It’s important for a team to know where they are during work hours. Employ the FRISK Model: FRISK is a communication guideline. There could be a great employee that’s being held back by outside forces. When there’s a problem with an employee, it’s best to discuss the problem and find the source. Unlock their full potential. Be Convenient: If a client doesn’t go through the right channels to contact you, don’t brush them away. Listen to what they have to say, and give some advice. After that, you may direct them to the proper channels. Be personable: Clients can be hard to work with. They don’t always know how to express themselves. Meeting them in a comfortable environment can open them up to new ideas or better communicate their own thoughts. Be sure to meet with new clients face-to-face to build a rapport. 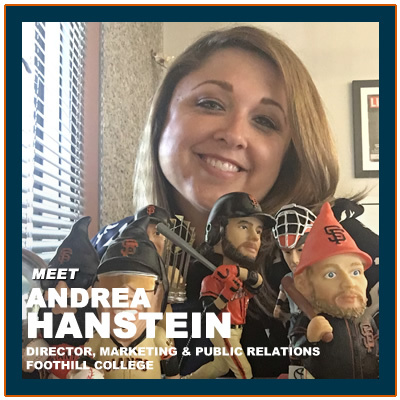 First of all, tell us a little bit about your career journey and what lead you to becoming the director of marketing at A & PR at Foothill College. Hanstein: I was 18 years old and went to the University of Southern California. I was convinced I wanted to be in broadcast journalism, so applied to the school, got in. After a year thought, I don’t want to be a broadcast journalism major. Talked to an advisor and heard about this new, to me, field called public relations and USC was one of the first school to have a degree in that. It kind of matched my strengths. The rest is history I guess, as they say. I graduated and worked in corporate PR. Pretty soon realized it just wasn’t for me. I wanted to, I like to use the term “sell” something that I believed in. I believe in education. I saw a job opening at Fullerton College in Orange county, down the street from Disney Land. Had no experience with community colleges. Like I said, went straight to four year private. I was one of those people unfortunately, like so many, who think, “Oh, community colleges. That’s where the not-so-smart kids from high school went.” Applied for the job and got it. Have become one of the fiercest advocates for community college. I believe so strongly in what we do. I can’t believe I ever thought that we were where the not-so-smart kids went as a last resort. Medford: It’s actually quite the opposite of that, isn’t it? Hanstein: 100%. I’m always telling people, go to community college. I think my friends and family are so sick of hearing me talk about it. Worked at Fullerton for about 13 years. I’m originally from Northern California, so after a while decided I was ready to come back home. Knew about the job here, knew about the college from my predecessor who had transitioned into the academic world. Two years later, here I am. How big is your staff there? Hanstein: I have 8 staff members. I am over marketing public relations and I did in the last year have outreach put under me. That I inherited two awesome staff members. In addition to those 8 I do have a variety of student [inaudible 00:04:55] release. Besides the outreach, what are the other kinds of talent do you employ? Hanstein: I have two graphic designers. I have some writers and then two others who deal with web and social media. Medford: That’s a pretty decent size staff. I know there’s a lot of people that are probably jealous. Hanstein: I know the feeling. For half my career at Fullerton, I was me, myself, and I. Then I was so excited when I got one staff person. I 100% know that I am lucky. Tell us about the size of Foothill College and your footprint. Hanstein: Foothill College is in Silicon Valley. We are located in one of the top ten most expensive zip codes in the country in Los Altos Hills, California. Larry Ellison, the founder of Oracle, has a house down the road. I came from a very urban Hispanic serving institution to a very … It’s obviously not rural, it’s in the Bay Area. We’re in an area that is very open, our campus is not in the middle of a city. It’s out near these huge estates. We serve about 15,000 students year. That’s down from where it was before the big California budget crisis. We’re slowly gaining. Huge transfer institution. We also are very well known for our allied health programs. This fall we will be on of the thirteen California Community Colleges authorized to offer a bachelor’s degree. We will be offering ours in dental hygiene. Hanstein: Yeah. Obviously transfer focus and a real big science and tech focus as well, being in Silicon Valley. Today we’re going to talk with you about managing and inspiring a successful team. This is something that I know I really struggle with in my business, and I’m sure community college marketing directors everywhere feel the same. Is that what you’re saying and hearing from a lot of people? Hanstein: Yeah. When I took this job, I had a private interview with the president and the cabinet. The team that I was taking over, there had been almost a two year gap between directors. They were supervised kind of in name only by student activities. Some people had been here for years. There were some retirements happening, and some disgruntled employees. I really quickly learned, when you’re a manager you often feel like you’re pulled in 18 different directions. You have meetings take up the bulk of your day. You’re trying to get your work done. Oh, and then I’m supposed to manage all these people. It was a huge, huge challenge for me. I knew it going into it. I would think if you took an impromptu survey of managers, they would say that’s one of the biggest things they struggle with. There was a survey in Forbes Magazine a couple years ago that said on the flip side, 65% of American employees would choose a better boss over a raise. Obviously it’s also an issue for employees who feel like they don’t have or they wish they had a manager who could devote time and attention to them. I think it’s a big issue for employees and supervisors. The mindset of the worker today is so much different than it was with our parents’ generation. Is it not? Hanstein: Yeah. I know my dad worked in the same company his whole life until he retired. You just did it. That’s what you did. Now we live in an era where making sure that I feel empowered and valuable and I’m happy at my work. We questions things like that whereas our parents’ generation didn’t do that. You just went to work. That’s what you did. Now, we’re all about being fulfilled and happy and work life balance. I think it’s a much bigger deal. What makes a team dysfunctional? Hanstein: There are a lot of things that can play into, but I would define them as … There’s an article called the five dysfunctions of a team. They define it, which I agree with, as the absence of trust. Remember, these also go not just from employee to supervisor, but employee to employee. I know a lot of the conflicts that I have dealt with are not between me and an employee but between two of my employees. If you don’t trust each other, you’re not willing to be vulnerable, which in any team dynamic, you need to be able to be vulnerable and feel that comfort zone. A fear of conflict. Conflict has a negative connotation, but there can actually be healthy conflict and healthy dialogue. Instead of having conflict, everyone just acts like, sure, everything is okay. Especially in a creative field. That’s what you want is passion and people to debate and come up with the best ideas that they can. If you don’t have that then you’re not going to be successful. A lack of commitment. I had an employee who really struggled with this. Just not caring, not taking pride in what he or she does, not being committed to the team and the college and the work that you do. Avoidance of accountability. Huge. I was just talking about this with my sister this weekend. She works with somebody who whenever she’s called on something, it’s never her fault. It’s always somebody else. I think we’ve also always seen those employees where they get … Sorry, a large truck is driving by my office. Medford: No problem. That might happen to me as well. Hanstein: They move. I think a lot of times, at least in California, instead of dealing with employees you just move them around from department to department. It’s amazing because no matter where they go, they have the same issues. It’s never them, it’s always somebody else. We do need to be able to accept responsibility and be accountable. Then, inattention to results. Focusing on their success versus the team their ego comes before the team and that’s huge. Your leadership style kind of sets the tone within the organization. What are the different types of leadership styles. Do you have any recommendations for implementing a style of leadership? Hanstein: I had read, I believe part of grad school, I had read a book called T-shirts and Suits: A Guide to the Business of Creativity. It’s by a British author David Parrish. He also wrote a book called Chase One Rabbit: Strategic Marketing for Business Success. He lays out six different leadership styles. What he talks about is there’s these six leadership styles and as a manager you should have a familiarity with all of them, but that you should be really well versed in one or two of them. The style that he talks about are coercive. That’s kind of a kin to a dictator. What we think of more of a masculine type of leader. That also sounds very negative, but that is very useful in emergencies. If you’re campus, in California it’s big that we have wildfires that often encroach on campuses. If you are trying to evacuate the campus and get notification out that you’re shutting down your campus, that’s a real helpful style to have. As a day to day, probably not, but it’s good to know what that is and when to bring it out. He also talks about authoritative. That’s when you focus on a goal or a vision for your college or your department. That’s very helpful when you are maybe doing a new project, or if you’re like me and you’re coming in and taking over this really tired crew. Being authoritative and setting the vision and setting the goals and moving forward. He also talks about affiliative and that is a really valuable in a creative setting. That’s a people person. I think in my two years here I’ve focused a lot on authoritative and affiliative. That person, like I said, is a people person. They’re focusing on their team, they’re building their team, creating alliances both within their department and outside of your department. I’m sure a lot of people when you’re starting a new job have read the book The First 90 Days. It talks about when you start a new job, you have to manage down, across, and up. A lot of these things aren’t just within your own team, but how do you interact with Deans, or how do you interact with your presidents cabinet? It’s not just how you and your employees act. Democratic. That’s the listener. That’s someone who listens to everyone’s opinion and tries to get people to build consensus. That’s helpful because you do want your employees to have buy in to feel like their opinion matters. Then there’s the pacesetter. That’s kind of affectionately referred to as the superman or superwoman. I work at level 10 and I expect you all to work at level 10. That’s probably not always a good thing to be at. Different people have different styles and different strengths. It is helpful if you really do have a well functioning and motivated team. Here’s a way to take them to the next level. Lastly, the coach. That’s the nurturer who really focuses on improving their team’s strengths. It’s useful if you’ve got an employee maybe who’s just coming into the workforce and you want to develop them into more seasoned professional. If you have somebody in your team who you think might be great to make that leap to management, that’s a good style to bring out. I kind of feel like I fall in the authoritative section with the goals. Setting the goals and expressing those to your team. I think what gets frustrating is when they don’t care about the goals quite as much as you want them to. That’s a really interesting … Kind of studying the different breakdowns of these different types of leaders. I like that. Hanstein: Again, he says you really should have one, like you just said. In general, you’re authoritative. Really, have a couple other ones that you can pull out of your pocket when you have a new project or a new situation. It’s a great book. It’s pretty easy to read. I highly recommend it. Let’s say you’re the new marketing director at a community college and you have a dysfunctional team. Where do you start at the ground level? Hanstein: First you start crying, and then when you’re done crying … No. I started here in May. That July, I was adamant. We need to have a staff retreat. We got all together and one of the first things that I did that I think people are really afraid of is we talked about the bad. I wanted to hear from especially one employee who was very disgruntled. Tell me what it is your feeling and why you’re feeling that. A lot of things came out. Even your toughest employee is a human being. One of the first things you learn in customer service is people just want to be heard. They want to get their thoughts out. Often times, kind of like you vent to a friend, once you vent you feel a little bit better. I just asked everyone. Let’s go around the table and really talk about what is it that you don’t like, that you wish was different. I didn’t stop there. I didn’t just say, “Okay, great. We vented. Now let’s move on.” It was, “Okay, you’ve told me what’s bad. Now, how do we fix it together? I think that’s really valuable not just to gloss over and go, “Hey. I’m new. I’m here. Let’s move forward.” To really acknowledge the good and the bad that’s happened in the past. I also did a really great … I typically hate icebreakers and I know when I told my team we’re going to do an icebreaker, they all rolled their eyes. The icebreaker was everyone on their own had to answer five questions and then we shared them with the group. The first one was, I came to work at Foothill College because … The best project I’ve ever worked on was … Working at FootHill College has taught me blank. When people ask me about Foothill College, I tell them blank. This year I plan to accomplish at work such and such. It was really interesting. I’ll be honest. There was one employee who some of his answers, it was really clear he didn’t have the passion for the job. Why I couldn’t solve it, but as we were sitting at the table I made note of that and followed up with him on what can we do to make you care about the college and to care about your work. It turned out after a while he was of retirement age. He really decided that it was probably time for him to go. If they’re not retirement age, maybe you think of ways to inspire them. It was a really interesting exercise. I think we all learned a lot about each other. Went over team expectations, both mine and there’s. What is it that they’re expecting from a manager and what am I expecting from them as my team? Then we went through, it’s so simple, but when I’ve talked to people about this, it’s the one thing people don’t do. We create a functional job chart. We all have our job descriptions from when we got hired. We went through and listed out every, even if it’s a little thing that we did, and then put who was the primary person for that task and who was the secondary. I can’t tell you how many times we have referred to that chart since we came up with it. That’s how I chose to get the ball rolling. Communication is a biggie as well. How do you build communication with a team? Hanstein: I always recommend that you start off by doing some sort of personality test profile. You can go in depth and do the Myers Briggs. One that I found worked out well that a friend had recommended to me is the Step Up working personality profile. If you Google it, it’s not expensive it. It comes as part of a book but you can just buy the profile. That is a valuable tool because it really does focus on your working style. We did that then we all went and shared with each other. First we all guessed what the other one was and then we shared with each other what we really were. I am constantly amazed at the number of managers who do not have regular staff meetings. My team, we have them every week. Again, I have meetings galore, so I am not in favor of meetings just to have meetings. These are so valuable. Medford: When do you have those meetings? Hanstein: We choose ours Monday mornings because it’s before the week gets going, before everyone can make excuses that something came up. One of the things that I learned in our staff retreat was some of the team members felt like they were disconnected from what we was going on in the college at large. I forget that I’m on cabinet, I’m on our shared governance council. I hear everything that’s going on. They really wanted to be more in the know. We start our meeting, I share with them any general college things I think they should know about, then the second part of our meeting is any group tasks that we’re doing. We put out a quarterly e-magazine. Right now that’s a big topic for every meeting. Every staff member, we go around the table and they share one or two things they’re working on that the other need help with, they want us to know about, and we’re done in an hour. I am adamant. It starts at 9 and it is over at 9:59. Medford: Do you have an agenda for this meeting? Hanstein: I do. I print those out. Everyone is always encouraged to submit their items to me. Another also small thing that we do, I’m sure many of you are on Outlook. We share each other’s calendars. I don’t just get access to their calendar. They share with each other. Even minor. If they’re gone and a client comes in looking for them, they can look on their calendar and say, “They’ll be back at 1 o’clock.” I don’t make them put what they’re doing on the weekend or what they’re doing after hours, but from work time we need to know where they are. We all need to know where each other is. I found that those ideas have really worked well. Do you use any type of project management system or chat tools? Hanstein: Yeah. We are very lucky. Our web programmer resides in my office. He loves to build things. That’s just like his thing. We looked at some off the shelf stuff, then Bradley, our web guy we call him, he was like, “I can totally build something that’s really customizable.” If anybody is interested in that, Bradley will happily share how he did that. I think the basis for it is FileMaker Pro, but I am not 100% sure. It’s web based. We will gladly share the front and back end with anybody who’s interested. It allows us to collaborate. Allows me, the supervisor, to see who’s doing what. I often just don’t have the time to know that. When I have a few minutes I’ll go on and look and see what everybody is working on. It’s awesome. Any chat tools that you guys use? Hanstein: We are an Apple school so we all have iMessenger on our computer. Yeah, we do that with each other. It’s on all day so you don’t have to get up and walk the five steps. We chat and then also we are very lucky, we are in our own suite. Everyone has a private office and we open up onto an area with a big conference table and some of our shared paper shredder or whatever. We have two huge whiteboards. One that we have forecasted out for the year in large projects that we know we’re going to work on. Another one is just a brainstorming. We do a lot of brainstorming. We have a huge bulletin board where we put designs that we like or funny things that we’ve read, kind of like an inspiration board. We’ve also recently started decorating our office with a lot of our posters that our team has designed. When you go into a professional ad firm or marketing firm, the way they decorate their space is huge. I’ve been on a tour of Google. They really create spaces that foster creativity. Again, that’s not always how community college is, or higher ed is decorated in general, but I would encourage you to make your space like a professional marketing or communication firm would be and inspire creativity. I think also, when our clients come in to meet with us, it kind of even inspires them to see everything. Who do you consider your clients to be? Hanstein: We call, or I. This is my mandate. I believe firmly that we are a service to the college. Clients to us are anybody on the campus who wants to work with us. If it’s a faculty member who needs a flyer for a new class, that’s a client. We refer to people as clients. How do your “clients” go about submitting requests to you? Hanstein: We have an electronic work order system for tracking purposes, like I sad. If they have worked with us before, it’s kind of routine. They just go in and fill out the work order system. Then we contact them. A lot of people though, this is also new for the college. We’ve had the system for about a year. We still get a lot of emails saying, “Hey, I need such and such.” One of the things that I don’t like, God bless them, but at both of my colleges, whenever you needed anyone to come touch your computer, the first thing out of their mouth was, have you submitted a trouble ticket? They would never talk to you until you’d done this. I don’t want to be like that. If somebody comes and has a project, I always say of course. Engage them, talk to them, find out what they need. Then after you’ve figured it out, ask them to please submit a work order. We don’t want to be that department that’s, oh we can’t even look at you until you’ve submitted a work order. Medford: Absolutely. That just creates a toxic environment that just seeps through every single department in the school, doesn’t it? Hanstein: Exactly. Unfortunately that is all too prevalent. I think with a lot of our … Facilities is another area you hear of that does that. One of the things I learned from really talking to the campus when I got here was the marketing department before had a less powerful work order system. There was a central person in the office who took all the work orders and communicated to the designers or the web team. That was creating a lot of friction. The designers wanted to be able to talk to the clients and get a feel for who they are and what they do. We also made a rule in our department that if this is a new project, we always sit down and meet with the client face to face. We find that clients really appreciate that. Just you know, getting to know their personality. They may say what they think they want in the work order, but when you really talk to them and get to the bottom of what they want, maybe it’s different or you have another idea. I really encourage people to meet face to face. I think I’ll talk about later, but I read Hub Spot which is a big marketing blog. They had an article earlier this year about getting out of your office and meeting with clients in their offices. We tried it that day. My lead designer had a meeting with a client who is just notoriously difficult. He said, “You know what” I’m going to go and I’m going to meet with her in her office.” He said it was like a totally different. She was much more relaxed and confident and able to express her thoughts. It was something about coming here that she just kind of felt overwhelmed, like, “I’m in marketing and it’s so high energy and high powered.” That’s a trick we use. We kind of mix it up. We like to have them come here to see all of our designs, but go out, meet with your clients in their space so that they feel comfortable and confident as you’re meeting with them. Going back to the team a little bit. Is it important to build connections outside of work as well? Hanstein: I believe so. That is something that you can’t force. I do have an employee who we just had a conversation a few weeks ago in our one-on-one staff meeting. That’s just not her thing and you have to respect that. We are with our colleagues more than we’re with our family in terms of waking hours. You are with each other hopefully at least eight hours a day. I think the more you get to know each other on a personally level, I think the more invested you are. Once a month we have a game lunch where we either bring our lunch or we order in and we play a game, all of us at our conference table. It’s just a change to relax and laugh and get to know each other. One of my employees, her mother died a few months ago and she had to be out for a while. I think when you create those connections, everyone was willing to pitch in. You didn’t even think twice about it. Yesterday one of my employees, he takes a boot camp here in the morning and he tore one of the ligaments in his leg. Two of my staffers came in early to help him and get him to his car and offer to take him to the doctor. I think when you create those connections, you just function more effectively and you also know trigger points to avoid or how to talk to each other. I do think that that is really important. There has to be some situations where a team member simply isn’t the right fit, right? Hanstein: Yes. We here at my district have a model that we employ called the Frisk Model. F-R-I-S-K. It’s a way of dealing, documenting employees and trying to bring out the best in them. They give tips also if you’re going to talk to an employee. If you have an employee who is consistently late, instead of attacking them for being late, it sounds simple but we forget to do it, is hey, so and so. I’ve noticed that you’re having some trouble getting to work on time. Is there something going on in your personal life? Is there something I can do to help you get here earlier? Approaching it in a more constructive type way. Then, the rule is, document, document, document. The Frisk Method really encourages having the conversation, saying what you’ll follow up in writing, and then sending that email to summarize what it is that you talked about. I’m a big believer in write the email beforehand so that you stick to your points. If you have to modify the email, great. Modify it and send it. Unfortunately, I did do this presentation with my friend Heather McDorman from St. Charles College in St. Louis. We have both, unfortunately had to lay people off and that is very painful, even if you know in your heart it’s the right thing to do and the person is miserable. It is not fun. I have noticed in my career in higher ed, we’re afraid to do that a lot. I think if it really isn’t a fit and you’ve worked with the person, then you need to not be afraid to work with your HR to do that. It makes everyone’s life miserable and it makes your team’s productivity just go stagnant. I love Michael Scott from The Office, but obviously he’s not a role model for what a boss should be. How important is being a strong role model for you employees? Hanstein: I think it’s huge. Just think about any of us. It’s cheesy, but the PSA when I was growing up about the kid smoking and he says, “I learned it from you, dad.” That is. If you’re going to sit there and want your employees to be productive or want your employees to be communicative or you want them to get to work on time and you don’t do it. That’s hard for them to buy into what you’re selling. I obviously, I think I’ve said this example before. I am a director. I do not work overtime. I often work more than 40 hours a week. I answer emails from home. Yeah, I do get to cut out on that rare Friday when there’s nothing going on. They are hourly workers. They have to, by contract, work 8 hours a day. I think there’s always going to be that perception, that, oh the managers just get to do whatever they want and it’s so easy. I do. I’m often times the first one in my office. I pitch in. I like to still write and help out. I think it keeps me creative and engaged. It’s just simple. If you don’t model what you want them to do, then don’t be surprised when they don’t do it. What are the state of things with your team right now? Hanstein: I would say we’re far from perfect, but we have really come a long way and I’m having fun with it. We definitely improved communication and accountability. The communication amongst my staff was a huge issue and I think it’s much better now. I also am not afraid. If we see little problems, I’ll call the employee and let’s sit down and chat. Why do we think this is happening? Much more collaboration with departments on campus. When I got here, people didn’t want to work with marketing. They were designing their own stuff. They were circumventing the process and hiring outside designers. They were having students design stuff. We’re now to the point where we have the opposite problem of, oh my gosh, how are we going to accomplish all this with our resources? So many people want to work with us. We, in January, submitted a program review that was comprehensive where we had to do surveys and a lot of data. Here at Foothill you had green, yellow, and red are the three things you can have. We got green. Passed with flying colors. The comments from the committee were great. I still do have to do on some days what feels like a lot of managing, but overall I do less managing of my team. I’m more, I like to think, of their cheerleader and their guide rather than having to constantly be in their business and dealing with conflicts. Again, that doesn’t mean … There was an incident a couple weeks ago that I felt like took a lot of my time, but that comes with the territory. If I have a real busy week and I’ve got meetings and I just don’t have the time to devote to them, they’re okay. I’m okay knowing that they’re doing what they should be doing. Medford: You’re never really done improving as a manager and improving your team. There’s always stuff to be done, right? You mentioned some books earlier and you mentioned the online resources like HubSpot. What are some other books or websites that are kind of a must read for people that want improvement in management? Hanstein: One that I read that totally changed my life was a book called Switch. I think the subtitle is How to Change When Change is Hard. It’s by two brothers, I believe went to Harvard. The Heath brothers. It’s a super easy read. I tell everyone to read it who will read it. It really does break down if you have a team … But it’s change for anything. In this case, if you have a team who you want to come in and you want to kind of shift the direction, they’re not real world examples. They obviously are based on real world. It’s a different scenario and they walk you through the different ways to do change. It really helped me in not only being a manager, but also in trying to implement some things college wide. Again, very easy read. A real fun one is Let My People Go Surfing. It is by the founder of Patagonia which is a big outdoor outfitter company. The company was founded and it was doing great and then it collapsed. The founder kind of reinvented the way that he envisioned his management philosophy. The title comes from they’re headquartered in between LA. and Santa Barbara, right on the water in Ventura. One of his philosophies is if you let your employees, if there’s a swell in the middle of the day and it’s 11 o’clock, it’s not lunch break, let them go surfing for an hour. They will come back more happy, more fulfilled, and more productive. He puts that level of trust in his employees and recognizes their employees. As a woman, I think Lean In by Sheryl Sandberg is amazing. I think men can learn from it, too. It’s all about work life balance. A great book called Tribes by Seth Godin. It talks about the different tribes we have in our life and obviously a huge tribe in your life if you work is your coworkers. Then again, HubSpot is a godsend. There are so many tools available for managing a team. We talked about Outlook and your internal tool that you’ve built. Are there any other neat tools out there? Maybe not even related to management. Just some neat tools that you think some other community college marketing professionals should consider implementing for their teams? Hanstein: Yes. The one that I wish they would pay me but they’re not, is Trello, T-R-E-L-L-O. It is a web based free application. It also has a great app for your iPhone. We started using that, we were searching for something that could be a good content management system for us. Unfortunately, one position that I don’t have that I put in a request for is someone who specifically does all of our social media. It is divied up amongst three individuals. It’s how do we decide what we’re talking about on a certain day and build consistency. It’s not just social media, but what are we putting on our website? We have electronic signage throughout our campus. We kept searching. We tried building in Excel. We finally found Trello. I learned about it at a web conference. It’s so easy and so intuitive. We sit down once a month at the end of the month and for an hour and a half we plan out our entire next month. We upload it all the Trello. You can even attach files and images. It’s great. Last night I had to do something. I just looked on my phone and it was there. We’ve also started experimenting with using it for large scale projects, like our college catalog that may be involves people not in our department. It needs to be more than just our work order system. Different content contributors and different deadlines. I cannot say enough about Trello. I will give anyone a tutorial, but you don’t even need one. It’s so intuitive. I can’t enough good things about it. Medford: That’s really cool. Basically it’s like boards, right? It helps you plan collaboratively. Hanstein: Yeah, and you can view them in different ways. You can view them as a list or whenever I’m looking at our content calendar, I can view it as a calendar and it brings up the whole month. Kind of like a Pinterest sort of type app, but it’s great. Medford: Maybe you can become a brand ambassador for them one of these days. Hanstein: No. I’m trying to think of what else. I subscribe to a lot of listservs to learn who s doing what and how they’re doing it. It’s not a tool, but I still think there’s nothing better than just good ol’ fashioned friendships and relationships that you build. I am a member of NCMPR, which is a professional organization. I have found more so than any other group that community college marketers are so not competitive. We love to learn from each other and support each other and share with each other. I had a little group that I’ve cultivated and we just email each other when we’re having an issue. This particular one, we email each other about employees. Dude, here’s what I’m dealing with. Can you give any advice, any help? Medford: That is so cool. Medford: I had the opportunity to go to NCMPR this year and I was really blown away by it. There was a lot of community colleges from North Carolina that weren’t there. Everybody I’ve been talking to here in our state, I just really encourage them to go. They have no excuse next year because it’s going to be in Charleston. Hanstein: Exactly. It’s so easy to get to. You were the President of NCMPR this past year. How was that experience? Hanstein: By some crazy thing I was president two different times, so last year was unexpected. There’s no other organization in the world I would do it for other than NCMPR. It’s going to sound like I’m being paid to say this but that is so valuable because if you’re a dean at a college, there’s like eight other of you at the college. I know here we have 12 deans, so they have each other. There’s not like another marketing department in my college. I think four year schools are structured much different, but nine times our of ten, a community college, you’re it. You’re the marketing department. You don’t have somebody to commiserate with and bounce things off of. I know you have your team. NCMPR has just been so valuable because to establish those relationships and talk about the issues and the challenges that we face, I could not put a monetary value on it if I tried. Medford: The Paragon Awards thing is a great opportunity as well, because you get to experience all the great work, all the great marketing that’s been done out there throughout the nation. You get to share ideas. I really hope these people I’ve been talking to in North Carolina will really participate in that next years. Actually, we just released an online video for Wayne Community College and I’m hoping it might have a good shot next year. Hanstein: I’ll have to go watch it. Medford: I’ll send you a link. Medford: Well, Andrea, thank you. There’s so many good stuff to be had from this interview today. Thank you so much for coming on the show.